La Paz, Bolivia is a strange place. It sits extremely high in the mountains (to the tune of 11,000+ ft above sea level), is home to the world’s most dangerous prison, and draws an extremely rambunctious international party crowd who, most days, don’t leave hostel grounds. 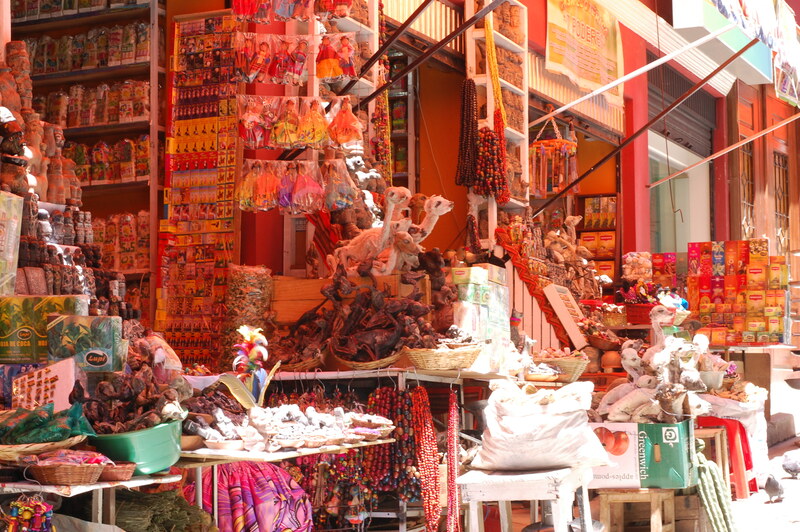 Even knowing all of these things, I was under the impression that two of La Paz’s open markets would be the strangest attractions—the Black Market and Witches’ Market. Surely, upon entering the Witches’ Market a woman wearing black would scurry out into the street, placing a curse on me for taking a photo without asking. And, of course, the Black Market would entail secret annexes and all sorts of obviously stolen goods that we simply can’t find in the US. Well folks, I’m sad to say, but neither of these daydreams came to fruition. While yes, the Witches’ Market was quite strange (lamb fetuses everywhere… I mean everywhere), there was a serious lack of frog’s eyes, magical cat dung, and other contraband that has surely been the focus of every witch movie ever made. Why would someone need a lamb fetus you may ask? I have no clue. But I do know that in just 20 minutes a “bruja” can complete an adorable hair wrap, complete with pretty feather fringe. Great. Let me know when the black cat pandemic begins. As for the Black Market, it was absolutely massive. However, there were no annexes (a-la New York City’s Canal Street) and a definite lack of sketchiness going on. I’d venture to say that about 50% of the Nikes on sale were real, and the dress that a little girl was trying on for her confirmation class was absolutely adorable. I know… exactly! Why is a little girl shopping with her mother for a white Catholic church dress in the oh-so-dangerous black market? Because it’s really just a sprawl of kiosk after kiosk of the exact same thing and there’s not much “black” about it. While I’m very glad to have left with the belongings that I came in with, I was really hoping to find a sweet iPhone7. One La Paz site that did fascinate me was the San Pedro Prison. Just one city block in the middle of downtown, it houses 1,500 inmates plus many of their families. Women and children often live in the prison as they’re unable to survive outside without the income of the husband. They are free to come and go as they please, but there are obvious risks involved with raising your children around drug dealers, murderers, etc. The prison is only guarded around the outside wall, and the inmates have complete control of what happens inside. Illegal tours are still available, despite some serious incidents in the past, but I went ahead and passed on that. Not really in the mood for a prison yard mutiny, you know? I’ve got plans. So in conclusion, the next time I want to see something really crazy and out of the ordinary, I’ll sit outside of the Wild Rover hostel and wait for a hungover Irishman to come out and try to speak Spanish with a local. THAT would be a sight.